I will be at the New York Comic Con . I'll be spending most of my time at my table in Artist's Alley (I3), but I will also have some signing times at the ASP booth (949). And ASP just informed me we will have 500 copies of Winter #5 available! We should also have copies of the RPG, Fall 1152, and the other Winter issues at the ASP booth. Top Cow is going to be releasing the cover I did for the Dragon Prince as a NYCC exclusive cover to issue #4. I will be signing Dragon Prince Covers at the Top Cow booth, though times are still TBA. Jeremy Bastian's book Cursed Pirate Girl is currently in Previews (page 286 order code: FEB09 4407) Followers of this blog may know that I'm a big fan of Jeremy's work and so I'm very happy to see the first issue solicited. Cursed Pirate Girl is an all-ages nautical fairytale with some Lewis Carol influence. 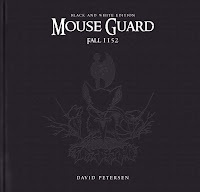 I think that fans of Mouse Guard will love this book too. Unfortunately there seems to be a mix-up in the previews listing...it has Jeremy AND I listed as doing the artwork. To be clear, I contributed a pin-up. Which can be seen here. Cursed Pirate Girl is 100% Jeremy Bastian goodness (he inks the whole thing with a brush!! A BRUSH!!!) 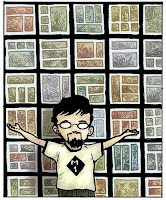 Jeremy also just relaunched his website, keep checking it for news on his book and artwork. Boom Studios asked me to do some covers for their new Mr. Stuffins series. The book is about a Teddy-Ruxbin style stuffed bear that is programed more the the vein of 007 than a kid's best friend. So I did 3 covers saluting the spy/espionage genre starting with #1 a car chase (with one of my favorite classic cars, a 1957 Corvette). I don't have solicitation dates yet, but keep your eye out for it in previews. I will be out-of-town for almost all of Feb. We start with NYCC and then a 12 day trip to Fairbanks Alaska for several events as part of the Guys Read program (more on that once I get back) and the last leg of the trip is Wondercon. What this means is that I will be out of reach for next month and won't be able to do my normal blog posts or respond to as many e-mails. I do plan on having some pre-written posts throughout Feb. that I can quickly make 'live' all about Old Time Radio. So until March, see ya folks! like to work on (besides Hellboy)? Oh there are plenty! 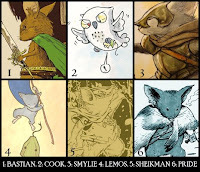 First person I have given carte blanche to do a Mouse Guard story anytime is Jeremy Bastian. His work is incredible and he has been there for the creation of damn-near every issue. Another, Based on his own comic series and his pinup from Fall, Mark Smylie is an artist/writer that would be a good fit. 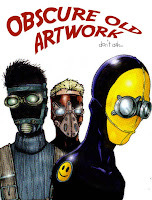 A further dream list include: Rick Geary, Joao Lemos, Katie Cook, Mike Mignola, Karl Kershel, Nate Pride, Alex Sheikman….basically artists who have a very unique style that is defining and focuses the point of good storytelling . I’m sure again I’m forgetting some. using the type of magic that the mice would have control of, I’m not against magic in the sense of the supernatural: ghosts, prophecies, various animal’s abilities to seem like they have esp, or things that would seem magical/supernatural to mice in 1152. I have not really employed this yet, but I’m not against using it if I feel it can be fit in to serve the story without seeming like a loophole or a shoe-horned trick. 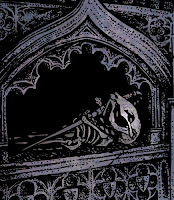 I’d say a mouse’s views on death in their 12th c. will be the first place I get the chance to explore these ideas. Sure. Here are a few images showing the transition. The two problems with the original designs were 1)I was referencing someone else’s work to achieve the look (Tom Phort) so I couldn’t keep it up indefinitely and 2) they looked more rat-ish than mouse-ish. This was important because the reader had to sympathize with the mice and consider them defenseless (not feelings associated with rats). 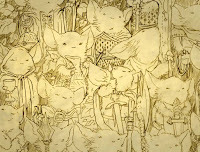 Further changes occurred because I didn’t know what medium I would do Mouse guard in, pencil? ink? watercolor? I didn’t know. It had to be something I felt comfortable with and could repeat page after page. After doing some OZ illustrations and redrawing the mice about that same time, I realized that I was very comfortable with the inking style I was using and could ‘keep it up forever’ (ß the thought that ran through my mind at the time.) Of course, further changes have happened since Issue 1 of Fall. That has more to do with getting comfortable with the characters and seeing what worked and what didn’t. Eyes got smaller, so did hands and feet, body stature became something I needed to keep more consistent as well as more characteristics to differentiate the mice. 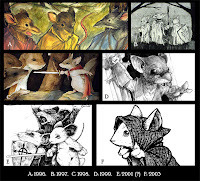 Mouse Guard artwork and materials? 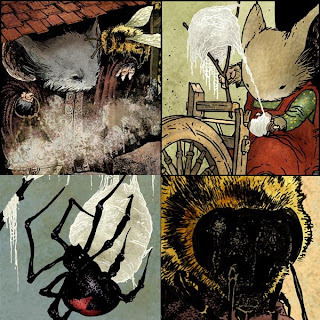 I would love an Art of Mouse Guard book…someday. I think we are way too early into me doing this to really be thinking about an artbook yet. I mean of the five story plots I had when I started Fall #1, we are only almost done with the 2nd. And I have written more since then! If something like that comes along, be sure that I want it to focus on unpublished art, things you haven’t bought already. (though I do like the idea of having covers reprinted sans-text.) Until then, consider much of this blog as an online art-of book. 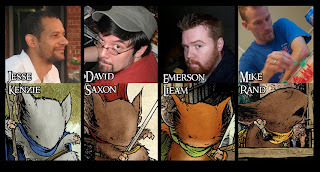 you foresee a Mouseguard movie sometime in the future? I think the CGI format would be the perfect way to showcase the world you've created. I agree and the comments have already gotten me excited and inspired by the idea. I was even looking over logistics of page counts etc. 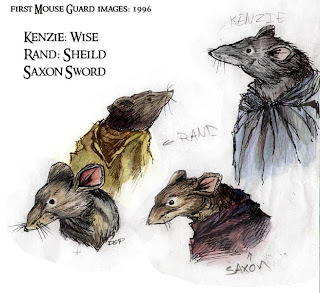 I have a story about Saxon & Kenzie’s first days as Guard Mice (a story that came out of developing background info for the RPG) A few stories about the June Alley Inn and it’s keeper, and some thoughts about how fun it would be to show all the tricks of a ‘weather watcher’. Thanks for all your Q’s. I’m going to try for 1 more ‘regular’ post before NYCC, but if you want to continue to ask more questions in the comments of this entry, I’ll get to them for a future Q&A post. Many of the main characters in the Guard started from the personalities or attributes of my friends. It was easier to think of the characters interacting with each other if I could reference our friendships or our experiences roleplaying together. That is not to say that Emerson is the mirror image of Lieam (I have never seen him jump into the mouth of a snake) Lieam started with Emerson, and has since become his own character. None of us are completely like our mice, but the ideas that started those personalities had seeds in our real life interactions. That is also not to say that the visual or the niche-to-be filled doesn't form the character. 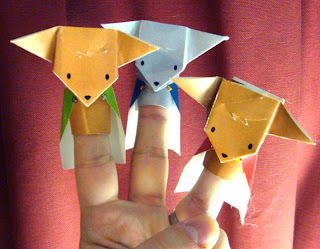 The first three mice I drew were Saxon, Kenzie, and Rand. The idea was that the trio would act together perfectly as one. Saxon means sword and with his fiery red cloak, he was the combat/offensive one. Rand means shield, his yellow cloak like a caution sign, he was the defensive one. Kenzie (taken from MacKenzie) means wise and with his blue cloak (which registers as 'calm' & regal for me) was the brains that tied them together. having any type of magic in your world? 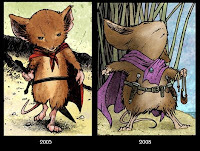 Rob, when I started Mouse Guard, I really felt that in most stories and comics or even in role playing games I had played, magic was both an easy way out and a knot for continuity. As a writer you have to establish rules for magic. If it can be used at any time, how it's performed, what it's weaknesses are, etc. And all of that has to jive with any story you have already written or ever will. If it turns out that the first conflict of your book can be wished away by a character revealed as a magic user later on, it weakens the stories altogether. 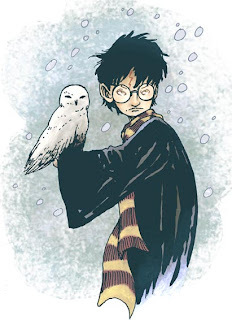 Someone who has done a BRILLIANT job of writing magic as an interesting part of life into their stories without ever tying themselves up in the loophole nature of magic is J. K. Rowling, and I'm no where near as clever or smart as she is. 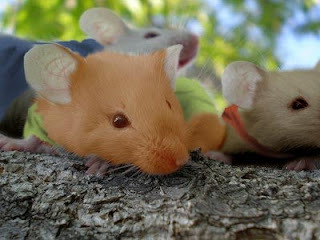 I also felt that if there was no magic, it would lend a larger sense of how helpless and downtrodden the mice would be. I'll say 'yes' to both. However I have no idea when. The Apiary keeper was just too cool not to ever draw and explore again, but I don't have a function for him (or the bees) to play in the upcoming stories. Spider silk is something that came up in the talks about the Role Playing Game and it spawned an idea for a story that doesn't tie in to any of the larger story arcs right now (but I have thought about doing it as a deluxe or annual issue). Who knows though...stories change from outline to illustrated page. The Apiary Keeper and the bees weren't ever in issue 6 of Fall..they spawned out of a lunch with Jeremy Bastian. Here is a quick video of me drawing Lieam. i hope that make toys with this. In addition to the printable Mouse Guard finger puppets designed and created by Katie Cook linked here, a set of PVC figures and a plushie version of Lieam have been released by Diamond Select Toys. Poseable figures were not something we pursued because of balance (tiny feet mean they need to be pegged to a base anyhow...so what is the point, movable arms?) Also for future Mouse Guard items through DST, I don't know. I'd love to see more from them, but with the comic series hitting such a pothole last year with the delays and ASP restructuring, I understand why they have not. Once we get the ball rolling again, I will look into extending the line. So that's it for this round. Feel free to comment more Q's to this post and I'll use them for next time! 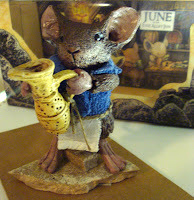 I know I'm a few days late, but I hope the fans of Mouse Guard and this blog are preparing (if not already having) a wonderful 2009. 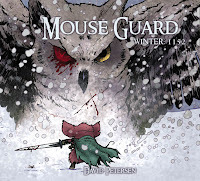 This year will bring the conclusion and hardcover release of Mouse Guard Winter 1152 (the LONGEST winter in history!!) I'll have completed my first children's book for publication, and I'll be doing more traveling (the goal was to keep the number of shows and appearances down to last year's list if not smaller...and we already passed that number) So it will be a busy but hopefully a happy year for the Petersens. I'm running low on content for the blog these days. I have work for Mouse Guard I can't show due to spoilers, and I have non-Mouse Guard work (Muppets, Star Wars, & a few other delights) that I can't show yet either. This keeps me hunting for things to blog about like the old artwork and games (I don't know how folks like James Gurney keep it up daily!!). I don't mind showing that old and obscure stuff, but it's not the only type of thing I want to share. So for my next post (unless I have amazing news or can start sharing the backlog of artwork) I'd like to have your suggestions on topics. Perhaps like a Q&A. So leave comments in this post and I'll not only try and answer them, I'll try and find some image or photograph that illustrates or enhances the answer. In tonight's wandering search around the studio for something to share, I saw my bronze mouse that I currently use as a bookend. I sculpted him from wax back in '96(?) and cast him in bronze for my sculpture class. It is supposed to be Saxon from an idea I had that once Saxon, Kenzie and Rand all return from the Winter War of 1149, they are so recognized as heroes, they are each offered towns named after them. Kenzie would stay with the Guard only visiting his town, Saxon wanting a large statue in his, and Rand retiring to become mayor of his city. As you can guess 98% of that idea doesn't jive with where Mouse Guard is today, but I plan on extracting the 2%, twisting it a bit and using it to pepper the future storylines. 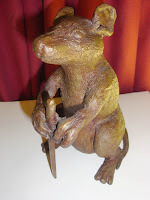 The bronze mouse made me think of one of the gifts I gave Julia for Christmas. This is her mouse, June, keeper of the June Alley Inn. June has barely been in the comics so far (I don't know that she will have a substantial role until the 4th series) But I try and include her in sketchbook pieces and the RPG cover etc. So I wanted Julia to have something special and unique of her mouse. Everything is super sculpy except for the stone base, hemp belt, terrycloth vest and cotton sash. I had an hour to spare so I decided to make a low poly cel shaded mouseguard fan characternamed Darius.